There are a few topics on this blog on the polemical spectrum that don’t happen to involve mirror neurons; one of them is the topic of Broca’s area and its putative role in syntax (see previous posts here and here). Our recent paper published in Brain and Language – (Matchin, Sprouse & Hickok, 2014) - addresses this issue. The hypotheses regarding syntax and Broca’s area were never ludicrous - the neuropsychological data suggesting a close link between Broca’s area and the grammar are quite striking, as well as compelling. Rather, there are two arguments, empirical and methodological, against these hypotheses: (1, empirical) these hypotheses ignore the fact that patients with agrammatic production and sentence comprehension issues appear to have intact syntactic competence, as shown by their ability to perform remarkably well on acceptability judgments (Linebarger et al., 1983), and (2, methodological) syntactic manipulations are often conflated with processing mechanisms – as such, increased activation in neuroimaging studies for, say, center-embedded sentences over right-branching sentences (Stromswold et al., 1996) may very well reflect computations related to how the sentences are handled (e.g., working memory), and not their syntactic properties. This makes interpretation of these kinds of neuroimaging results difficult – are the effects due to syntactic operations (e.g., Merge or Movement) or are they due to domain-general processing mechanisms like working memory? This second concern was addressed by a previous paper by another alumna of the Hickok lab, Corianne Rogalsky (Rogalsky et al., 2008). In that paper, Corianne showed that activation to sentence complexity in the posterior portion of Broca’s area – the pars opercularis – could be accounted for by domain-general verbal working memory. However, activation in the anterior portion of Broca’s area – the pars triangularis – could not be accounted for by verbal working memory. The present study shows that activity in the pars triangularis during sentence processing is sensitive to how the sentence is processed (active vs. passive processing mechanism) and doesn’t particularly care what the specific syntactic operations involved are, speaking against syntactic hypotheses of Broca’s area function. The study borrows from the psycholinguistic literature on the filled-gap effect, which in a nutshell demonstrates that sentences involving movement are processed actively (i.e., subjects predict resolutions to the open dependency) (Stowe et al., 1986). Contrariwise, sentences involving canonical anaphor binding (a different syntactic operation) are processed passively (i.e., subjects can’t predict resolutions to the dependency, because they don’t know there is a dependency until they get to the end of it). Previous research suggested some syntactic-specificity to the pars triangularis, in that a distance manipulation for movement sentences resulted in activity in this region, while a distance manipulation for anaphor binding sentences did not (Santi & Grodzinsky, 2007), consistent with the syntactic movement hypothesis of Broca’s area (Grodzinsky, 2000). However, in that experiment, syntax (movement, binding) was conflated with processing (active, passive), as the psycholinguistic literature indicates. Enter backward anaphora: unlike canonical anaphora, psycholinguistic data indicate they process these sentences actively, just like movement sentences (van Gompel & Liversedge, 2003). This corrects for the conflation between syntax and processing in these two constructions. Now, the question is: do backward anaphora show a distance effect in the pars triangularis? If no, then the movement hypothesis stands; if yes, then there is strong evidence to suggest that this region cares about a processing mechanism that can be employed for constructions involving different syntactic operations, with no indication of syntactic-specificity. The answer is yes – our results demonstrated a distance effect in the pars triangularis. There is more to the paper, but this is the key result: Broca’s area doesn’t seem to care too much about the syntactic details, but it certainly does care about the processing details. This converges with additional data showing that when you take movement constructions that aren’t processed actively (parasitic gaps), then you don’t get activation in Broca’s area (Santi & Grodzinsky, 2012). So, movement, anaphora, doesn’t matter – what matters is that there is active (predictive) processing. Many questions remain: How does the brain do syntax? What is the exact mechanism accounting for activation in Broca’s area, if not verbal working memory? Why do people care so much about Broca’s area? * These questions are largely unanswered in this particular paper, but I promise you that we have some ideas (and data) bearing on these questions, so stay tuned. Grodzinsky, Y. (2000). The neurology of syntax: Language use without Broca's area. 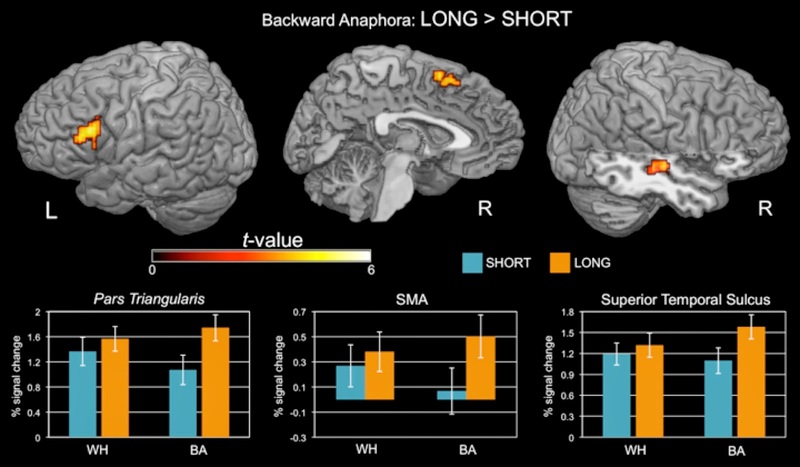 Behavioral and brain sciences, 23(01), 1-21.
anaphora in Broca’s area: an fMRI study. Brain and language, 138(11), 1-11. Rogalsky, C., Matchin, W., & Hickok, G. (2008). Broca's area, sentence comprehension, and working memory: an fMRI Study. Frontiers in Human Neuroscience, 2, 14. 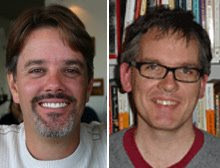 Santi, A., & Grodzinsky, Y. (2007). Working memory and syntax interact in Broca's area. Neuroimage, 37(1), 8-17. Santi, A., & Grodzinsky, Y. (2012). Broca's area and sentence comprehension: a relationship parasitic on dependency, displacement or predictability? Neuropsychologia, 50(5), 821-832. Stowe, L. A. (1986). Parsing WH-constructions: Evidence for on-line gap location. Language and cognitive processes, 1(3), 227-245. Stromswold, K., Caplan, D., Alpert, N., & Rauch, S. (1996). Localization of syntactic comprehension by positron emission tomography. Brain and language, 52(3), 452-473.
van Gompel, R. P., & Liversedge, S. P. (2003). The influence of morphological information on cataphoric pronoun assignment. Journal of Experimental Psychology: Learning, Memory, and Cognition, 29(1), 128. Embodied or Symbolic? Who cares!